The term “marginal revenue” refers to how much additional revenue a firm would earn from one additional unit of output. EXAMPLE: Marty owns a small-scale ski park in a location far from any other site suitable for skiing (so, in Marty’s local market, his business is a monopoly). Because Marty has no competition, he can charge whatever price he wants for admission to his park, and he can test different prices to see which is the most profitable. 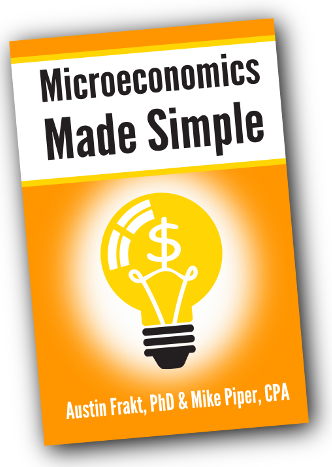 Assuming that a monopoly must charge each customer the same price for its good, the monopoly faces a downward sloping marginal revenue curve — meaning that each additional unit the firm sells brings in less revenue than the unit before. The reason for this declining marginal revenue is that the firm must reduce the price it charges for its product if it wants to sell more units. And that new lower price would apply to all units sold — including all the units sold to buyers who would have been willing to pay a higher price. 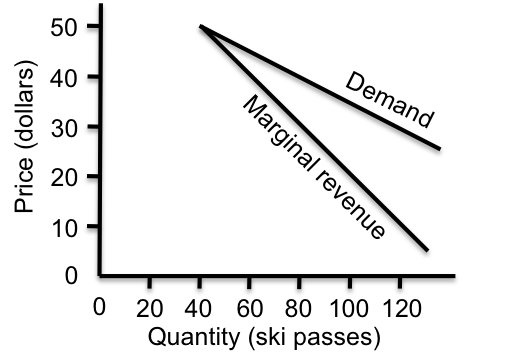 EXAMPLE: The following figure shows the demand curve and the resulting marginal revenue curve for Marty’s ski park monopoly. If he charges $50 for a day pass, Marty can sell 40 passes per day — for a total daily revenue of $2,000. Marty’s marginal revenue for the first 40 passes is $50 per pass. If Marty reduces the price to $40, he can sell 80 passes per day — for a total daily revenue of $3,200. The marginal revenue for the 40 additional passes sold is $1,200 (i.e., $3,200 minus $2,000), or $30 per pass. If Marty reduces the price further to $30, he can sell 120 passes each day — for a total daily revenue of $3,600. The marginal revenue for the additional 40 passes sold is $400 (i.e., $3,600 minus $3,200), or just $10 per pass. Marty faces declining marginal revenue (i.e., each additional pass sold brings in less additional revenue than the previous pass) because when he reduces his price to sell more passes, he reduces the price that every visitor to the park pays — even those visitors who would have paid a higher price. Note: As you can see in the above chart, for a monopoly, if the demand curve is a straight line, the marginal revenue curve will also be a straight line, with exactly twice the slope of the demand curve. Just like firms in other types of markets, monopolies choose to produce each unit for which marginal revenue exceeds marginal cost. That is, they produce up to the point at which marginal revenue is equal to marginal cost because this is the point at which the firm’s profit is maximized. Capital (manmade goods used to produce other goods — factories, machinery, highways, electrical grid, etc.). More recently, human capital — the knowledge and skills that make workers productive — has been considered a fourth factor of production. How should a society allocate its factors of production? One desirable criterion is to use all resources to their fullest capacity or, to put it another way, to use the fewest possible resources for any given level of output (e.g., if a set of kitchen cabinets only requires 100 nails, a carpenter shouldn’t pound in more). “Productive efficiency” is the term used to describe a situation in which this is achieved. 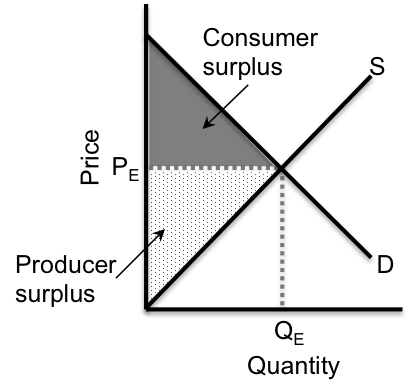 Another desirable criterion is that the factors of production are all used to make the quantities and types of goods that society most highly values. For example, if a society values the arts more highly than sports, it should invest more resources in the former than in the latter. “Allocative efficiency” is the term used to describe a situation in which productive resources are being used in their most valuable way.